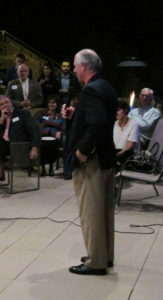 PCMS Vice President Dr. Robert Segal and his wife Anne Segal hosted a reception for University of Arizona President Robert “Robby” Robbins on Saturday, November 3. Approximately 100 guests were in attendance as Dr. Robbins, who practiced as a cardiovascular surgeon, expressed his interest in developing a strong relationship between the University of Arizona and the entire medical community around the state. Robbins joined the University of Arizona in June of 2017, after serving as President and CEO of the Texas Medical Center and chair of the Department of Cardiovascular Surgery at Stanford University.